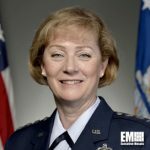 Lt. Gen. Wendy Masiello serves as director of the Defense Contract Management Agency. In this capacity, Masiello oversees federal acquisition programs and contracts with at least 20,000 industry vendors and leads an agency with a staff of nearly 12,000 people under the Defense Department. Prior to his current position, the 36-year Air Force veteran was deputy assistant secretary for contracting for three years. She also served as program executive officer for combat and mission support at the office of the service branch’s assistant secretary for acquisition, commander of the 95th Air Base Wing at Edwards Air Force Base in California and principal assistant for contracting forces in Iraq and Afghanistan. Masiello, an inductee into Executive Mosaic‘s Wash100 for 2016, is a recipient of numerous military awards, including the Legion of Merit, Air Force Achievement Medal and the Defense Meritorious Service Medal with oak leaf cluster. Masiello holds a bachelor’s degree in marketing from Texas Tech University, a master’s degree in logistics management from the Air Force Institute of Technology and a master’s degree in national resource strategy from the Industrial College of the Armed Forces.